"Our offense wasn't able to get into a rhythm today but fortunately for us our defense was able to contain them," said Morehead State head coach Greg Todd. "When the shots weren't falling for us we continued to hang in defensively and were able to pull out a victory over another good OVC team." "I liked how we got to the basket," added Todd. "I thought our ability to penetrate, draw fouls, and knock down our free throws proved to be a difference maker in the game." Jacksonville State claimed an early lead as a layup by forward Rayven Pearson put her squad ahead 13-9 with 3:15 remaining in the first period. A quick 9-2 spurt by Morehead State however put the Eagles ahead for good. Morehead State rode a 38-26 advantage into the halftime break and grew their lead to as many as 19 points in the second half. Trailing 60-44 with 7:40 remaining in the game, the Gamecocks offense found a spark as they used a 11-3 run to cut the Eagles' advantage to 63-55 with 1:43 to go after Jayla Walker sank a triple from atop the arc. The MSU defense held strong despite the run and closed out the game by forcing three Jacksonville State misses down the stretch. Senior Miranda Crockett led the Eagles in scoring with a game-high 18 points. The Martinsville, Va., native, who extended her double-figure scoring streak to 26 games, hit on a game-best 6-of-8 freebies while also corralling seven rebounds. 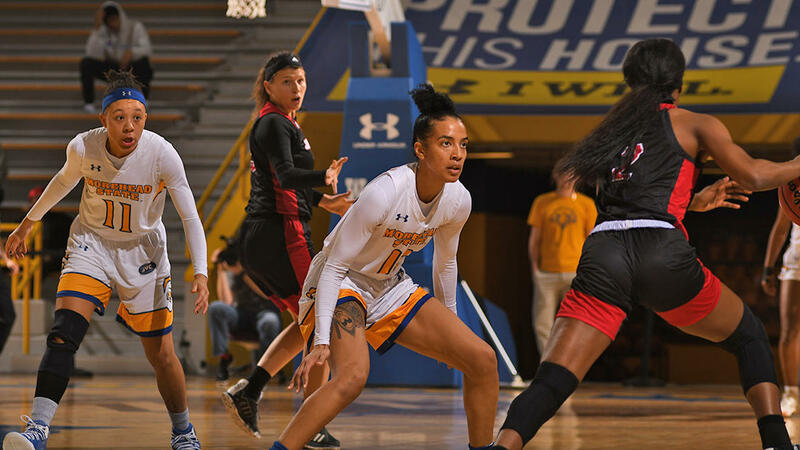 Three other Morehead State players joined Crockett in double-figures as junior guard Aliyah Jeune added 12, senior guard Darianne dropped in 11, and senior guard Crystal Simmons-Cozar finished with 10 points. Simmons-Cozar also logged a game-high five steals. Reigning OVC Player of the Week Tierra McGowan managed her third consecutive game with double-digit rebounds as she pulled down 11. The Gamecocks were led in scoring by Destiney Elliot with 17 points. Pearson pulled down a game-high 13 rebounds. Morehead State will take to the road as they travel to SIUE for their next game. The Eagles and Cougars are scheduled to tipoff at 12:00 p.m. ET on Thursday.